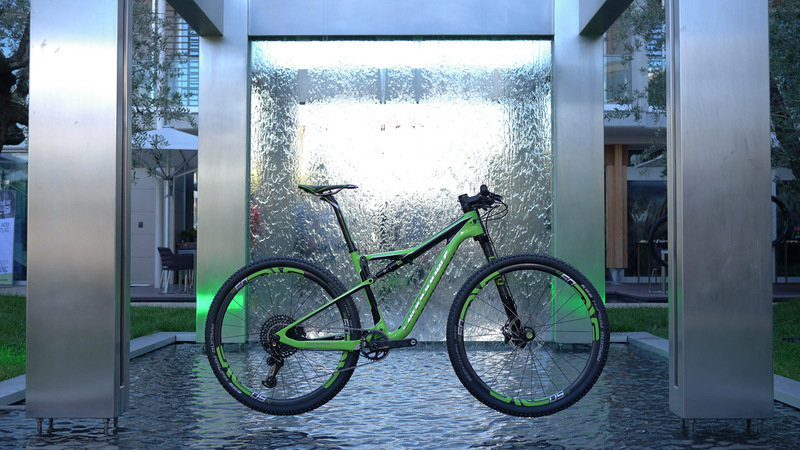 This week Cannondale held a press launch for the new Scalpel at Lake Garda, alongside the Riva Bike Festival, and had a bunch of journalists over to ride it and talk about some of the design tweaks they’ve made. I say tweaks, but this has been a major three year project for them involving a complete redesign to update geometry and accommodate new technologies. 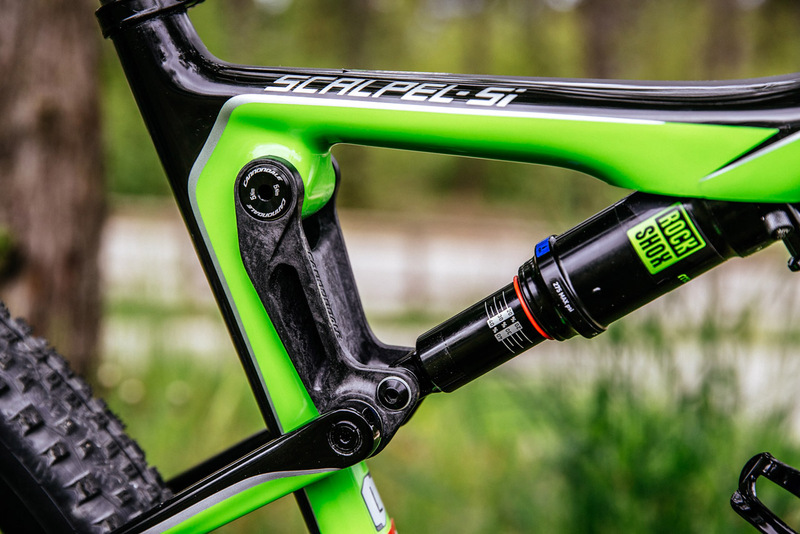 It’s impossible to design pretty much anything without making some compromises, but the design team for the 2017 Scalpel have managed to avoid a surprising number of them, making a very capable 100mm XC bike with some very clever features. 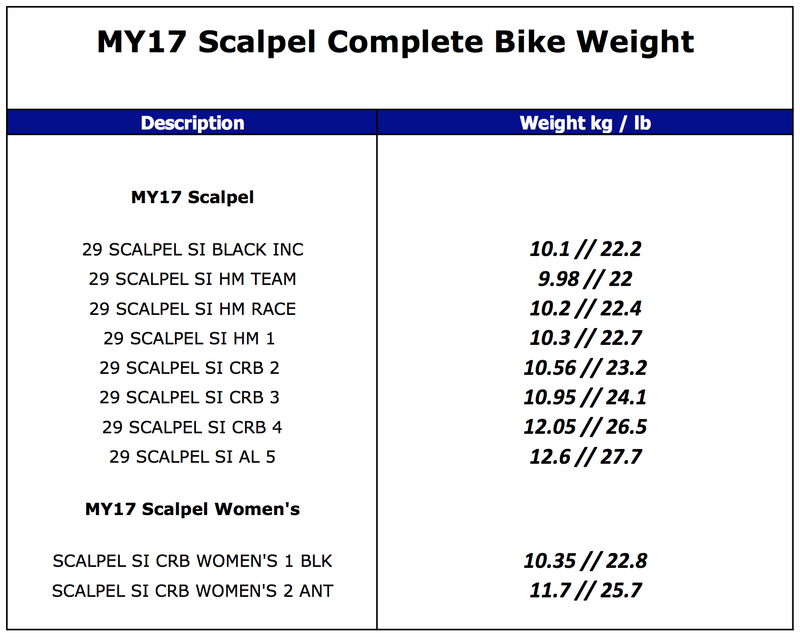 Scalpel Si Team with SRAM Eagle. Exceptional stick concealing skills on show here too. 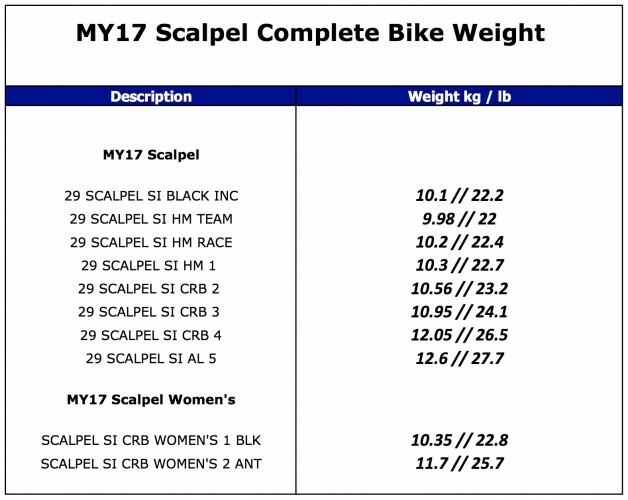 There are a variety of models, but we were all riding the Scalpel Si Race, pictured at the top of this story. So, those clever bits. Firstly, much like on Hope’s recent concept bike, the frame has a rear wheel offset that allows a dishless wheel, making it stronger while providing greater clearance. Unlike the Hope bike, which uses a custom made 130mm hub and the same chainline offset as boost (3mm), the Scalpel has a whopping 6mm offset on the drive side, allowing clearance for a double chainset and bigger tyres (XC, so only 2.35, natch. Though the Lefty means you could put something much bigger up front if you wanted). This is all with 435mm chainstays (425mm on the smaller sizes). 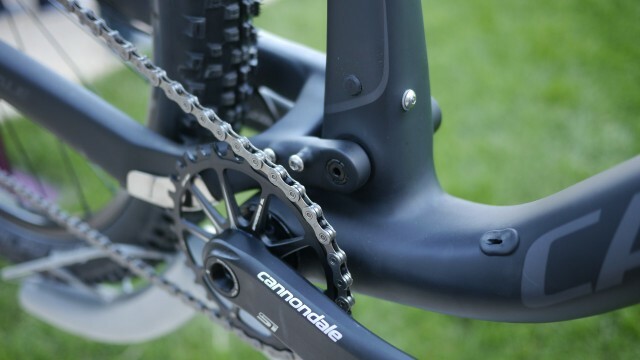 They said they wanted to do this without having to make the chainstay thinner, and that they have. 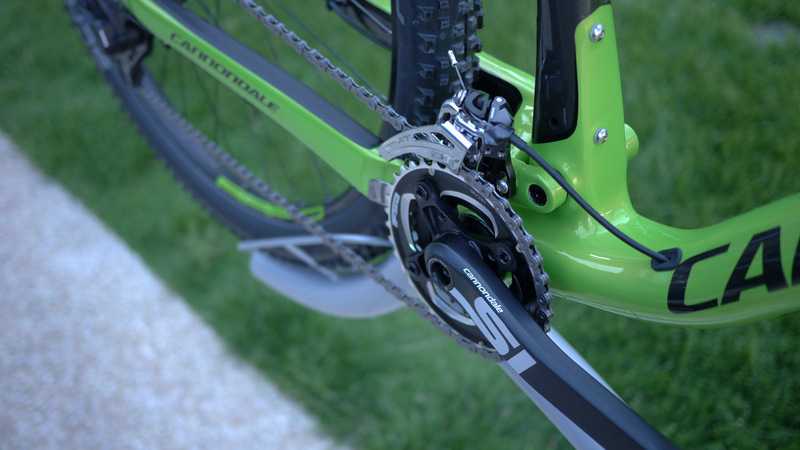 … and enough room to accommodate double chainsets without compromising on tyre widths. Secondly, the way the shock mount sits inside the top tube means the frame can be run with Di2 and a dropper post simultaneously. 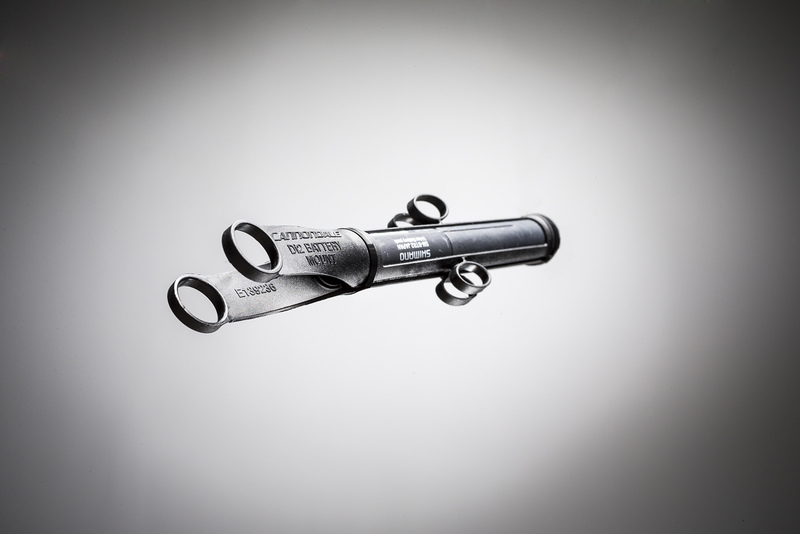 A battery holder sits inside the top tube, in front of the shock, leaving the seat tube completely free for droppage. 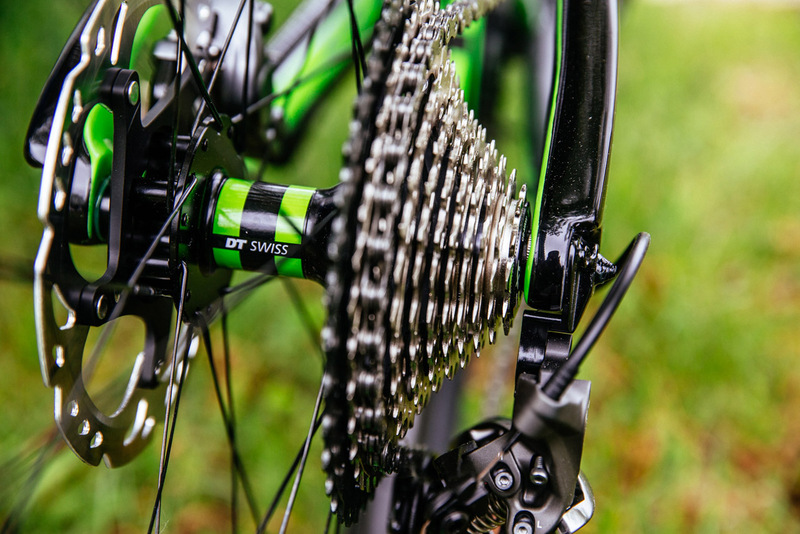 Yes, it’s unlikely that most riders will upgrade to XTR Di2, but with XT Di2 incoming and it no doubt tricking down in further years, this is a good bit of future-proofing. 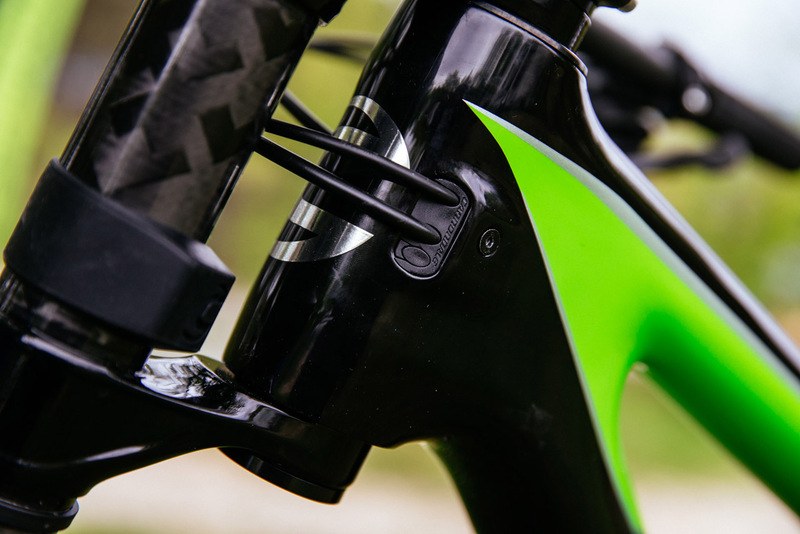 This is the Di2 battery mount, which slides into the top tube above the shock. The linkage uses a third fewer components than before, and is designed such that you can work on it with just a multitool if you need to. The bolts you see at the pivot are actually in an expanding thru-axle that locks the two halves of the swing arm together, reducing flex. Also, while it looks like GRP or some kind of thermoplastic, the linkage is actually carbon fibre molded under pressure, rather than laid up in sheets. As well as being cheaper to do than typical carbon sheet layups, this lets them do neat things like the debossed Cannondale branding on the front of it. See that linkage? Moulded carbon fibre rather than a sheet layup. While there is now a pivot at the bottom of the seat tube, there’s still none at the rear of the stays, allowing them to neatly flat mount the brake inside them. 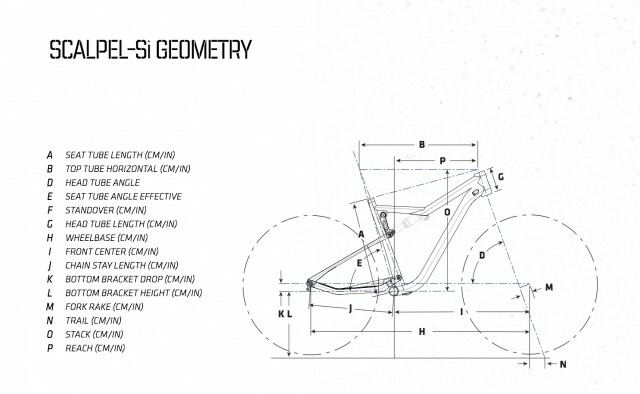 As well as that, they’re doing proportional wheel sizing with frames (smaller sizes on 27.5, and bigger ones on 29), and have tweaked the head angle and fork offset to give a (you probably knew this was coming) slacker, longer ride. Stems are shortened by a centimetre, so in all they have the same reach as older Scalpels but with a longer front centre. 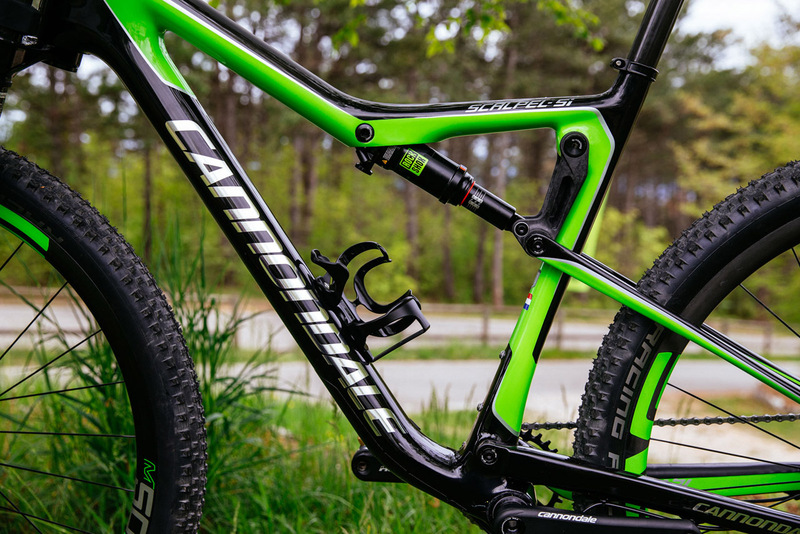 27.5″ wheeled models will have a 50mm fork offset, and 29ers a 55mm one. All have a 69.5 degree head angle (you’ll find the juicy geometric details at the bottom of this story). 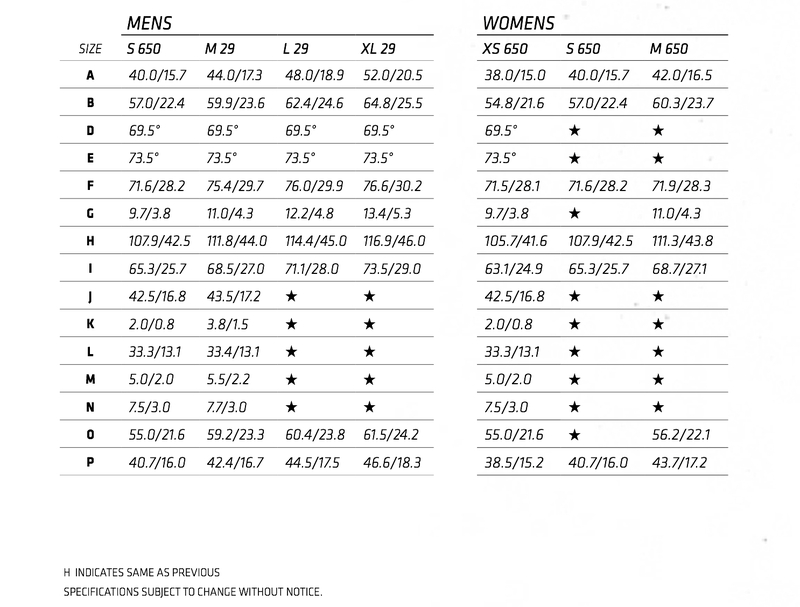 The size chart is quite heavily gendered, with women’s bikes only having 27.5″ wheels and men’s offering both 27.5″ and 29″ depending on size, but if you’re a small man or a tall woman, in my experience of knowing lots of riders there’s leeway and (OMG!) riding a bike not specifically made for your gender won’t be a biomechanical fustercluck. 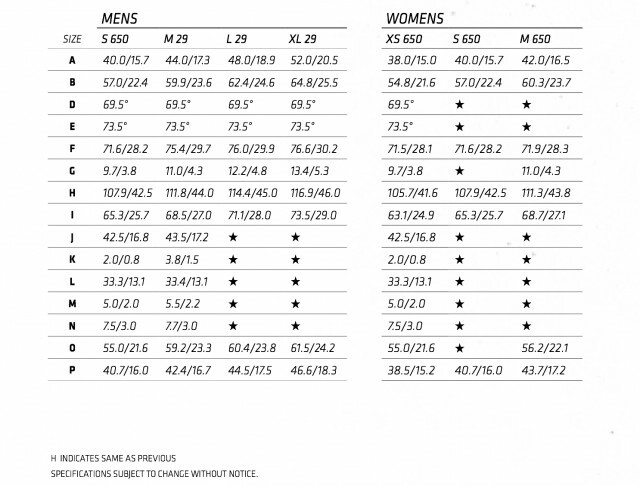 Also, while the sizing might be gendered, the colour schemes aren’t: no lilac or pink makeovers on show for the women’s frames, just bikes for all sizes of rider. The bolts for a second bottle cage on the seat tube are far enough down that you could still run a dropper post. Cable routing is internal but designed to be as easy as possible, with two large-ish holes in the head tube and a selection of plugs to fill them and gently grip various numbers of cables. 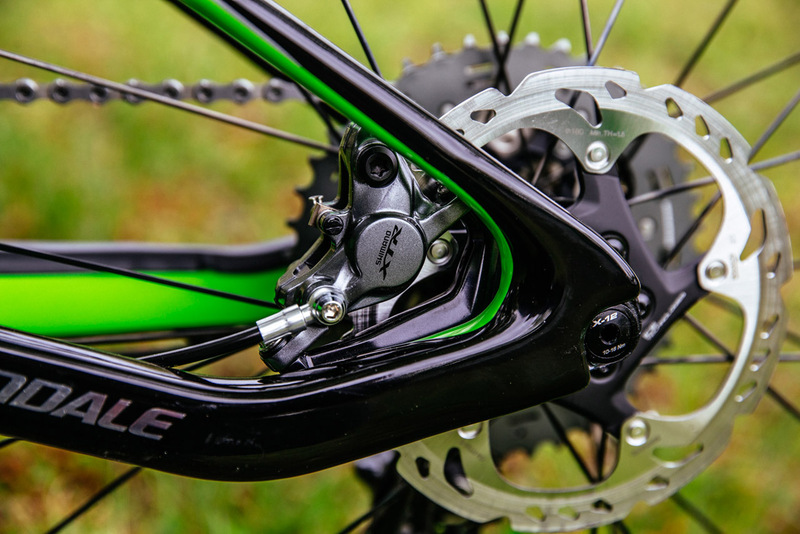 This also apparently eliminates cable rub on Leftys – I found this was true under most circumstances, but slow speed manoeuvres with the bars turned around 45º could still create a little bit of rub, so you may way to put a bit of helitape in. The new method of routing is a big improvement over previous offerings though. The frame does all of the above while still leaving room for two water bottles, and the seat tube bolts are low enough that you still won’t have to sacrifice a cage to install a dropper. 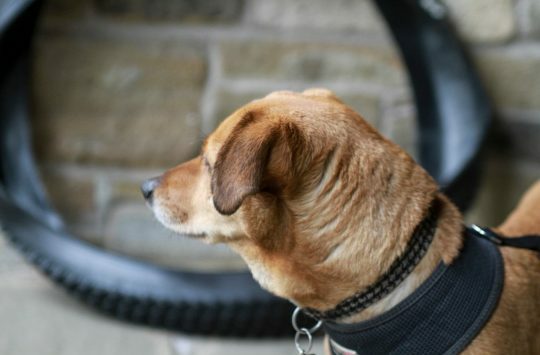 In all, it’s a very neat, well thought out bike. 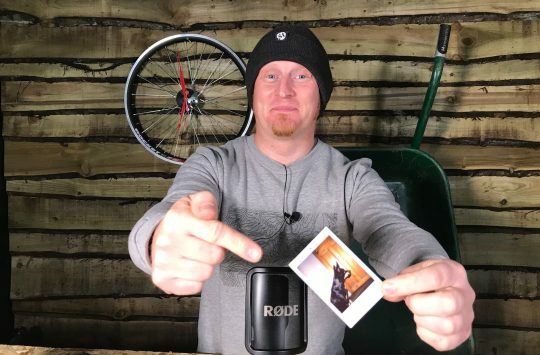 Look out for the first ride report very soon. Got to say it before anyone else 9 grand!!!!! It looks lovely, but 9 grand!!!! timraven, that is the most expensive model with XTR Di2, Enve carbon etc, there’s a full range of carbon plus alloy models coming as well. 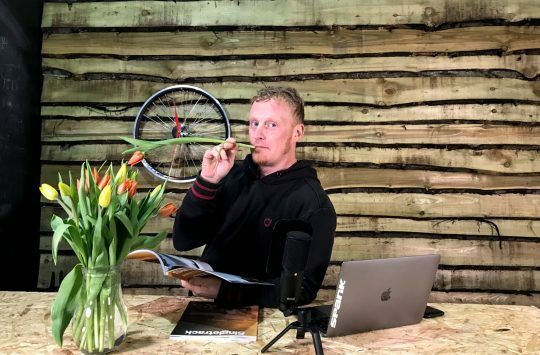 We did a show a while ago and a guy asked what our most expensive road bike was, when I said £7.5K he replied ‘is that all, where’s your £10K bike’? Some people eh? Rejoice all, the pricing was provisional and i’ve just checked and the Black inc is actually ONLY £7999.99 so form an orderly queue….